Add infinite sparkle with a band set with manmade diamonds. Browse Ada's Guide to Engagements, or learn about the 4C's and more in our education section. Want to upgrade or repair your current ring? Want to add another band for an anniversary or birthday? Learn more about Ada's restoration, upgrading, and replication services. Begin your life together with a commissioned diamond grown from your meaningful mementos. Ada Diamonds cultures diamonds from donor carbon, provided by you. 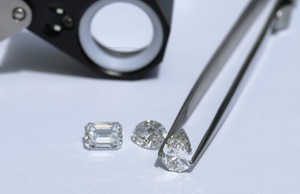 We can process and purify any carbon-containing items — flowers from your wedding, graduation keepsakes, excess materials from a house remodel — into pure diamond, making for the ultimate in meaningful, custom jewelry. We would love to celebrate your finest moments and memories with a commissioned diamond.